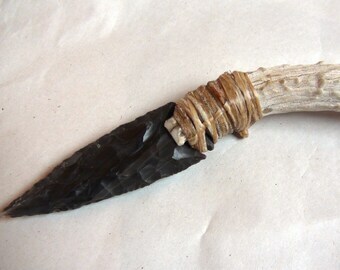 This is a hand knapped flint knife mounted in a deer antler handle. 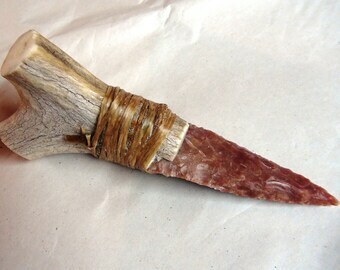 The flint is beautiful deep red-brown color. The handle is smooth fairly straight deer antler. 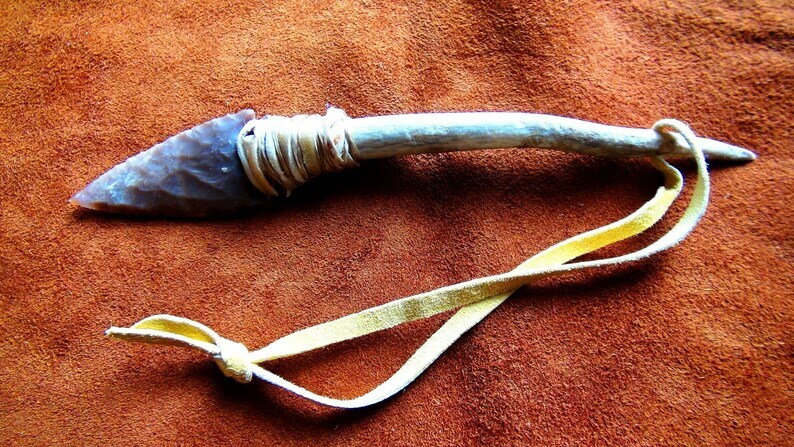 Elk rawhide was used to wrap the seat of the blade into the antler handle. Under and through the rawhide is waxed cording and beeswax was used to fill certain areas of the rawhide wrap that were uneven and so dried with small spacing. 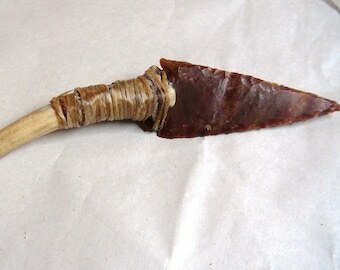 The rawhide is very tightly warped and the blade is very sturdy and well seated to the handle. Off the bottom of the handle is a goat leather strap. Total length of the knife is 9 inches. The flint blade measures roughly 2.5 inches long, 1.25 inch wide at the base and about and third of inch thick. Bought this for my Son. The quality cannot be rivalled. Authentic and primitive. Communication was prompt and very pleasant. The item arrived really fast and alot of care went into packing the item for shipping..I highly recommend. Recently, I bought several items from Viking Wolf Craft. Each piece was exquisitely hand made with a great deal of care and creativity, using only the finest natural, organic materials. 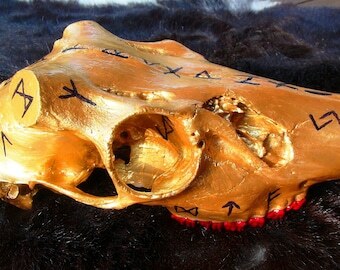 Consequently, I would highly recommend purchasing any one-of-a-kind artistically designed goods from Viking Wolf Craft. I guarantee that you will be extremely satisfied and happy with your purchase and will enjoy it for years to come! Priceless wisdom from the now defunct Wolf's Den that was luckily made available for download. I highly recommend this to anyone who didn't get a chance to partake in the Wolf's Den, the articles are very deep!